Guide and tips for crafting your way through Guerrilla Games' open world action RPG, Horizon Zero Dawn. Horizon Zero Dawn depicts an Earth ravaged by machines, as humanity struggles to survive in small, primative tribes in the now-desolate landscape. As Aloy, the player will be tasked with uncovering the truth behind the rise of the machines, as well as discovering her own personal history. Our complete Horizon Zero Dawn guide offers help with collectibles, overriding and mounting robots, choosing which skills to pick first, and much more. You can find all of that below, plus a few helpful hints and tips below to help you on your way. 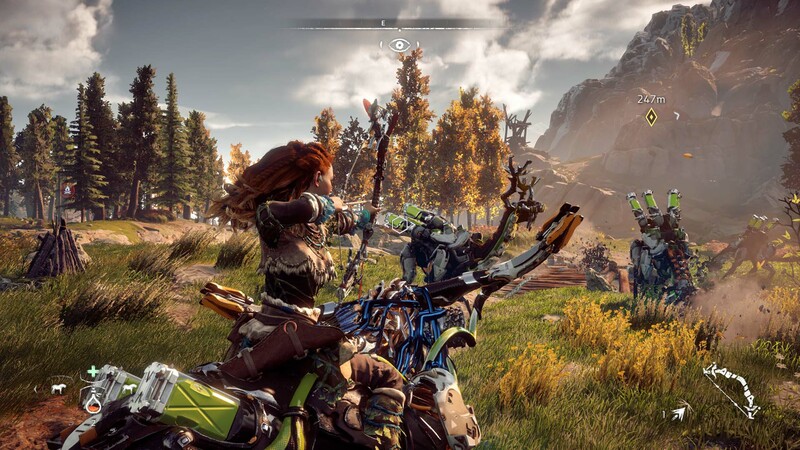 Aloy can learn many different skills during her journey to aid her in taking down, sneaking around, or just generally surviving the machines roaming the landscape. These are the best ones to learn early. The centerpiece of Horizon Zero Dawn is the tantalizing prospect of taking down lumbering, gargantuan machines with just your weapons and your wits. We show you how to handle the biggest, meanest ones. Modifying your weapons and equipment is key for bringing mechanical monsters down. We show you how to modify like a pro and create some devastating weaponry. One of the coolest aspects of Horizon Zero Dawn is the ability to essentially tame and ride some of the wild machines, though you won't be able to mount all of them. We teach you how to override machines, and list which ones you can then mount and use to ride on. As you progress through the game, you'll want to start making better and better weapons. Here's the best ones and how to make them. Over the course of Horizon Zero Dawn, you'll pick up tons of loot. This guide give you strategies for getting the most/best look, as well as a listing of all the rarest loot in the game. If you want the ability to override machines and even turn some of them into rideable mounts, you’re going to have to look for four Cauldrons. Here's how to find and conquer them all. There are five machines called Tallnecks scattered around the map of Horizon Zero Dawn. Climbing and overriding them grants a good amount of XP and uncovers a lot of useful locations on the map. Here's how to find and climb them. There are 30 Metal Flowers scattered around Horizon: Zero Dawn’s map. The flowers can be traded for valuable mods, and even 1000 shards from a merchant in Meridian. Here's where to find all 30 of them. Finding these cute little figurines can net you some big rewards. Here's how you find all six Banuk figures. Here's how to unlock the best armor in the game. Cauldrons are sorta like the tombs from Tomb Raider. They’re completely optional—but essential if you want a wholler experience. Cauldrons are typically at the foot of a mountain, where sometimes the entry might be hidden, and within them lies a mechanical dungeon. On your world map, they're marked by a small purple mountain-shaped marker. In the depths of a Cauldron is light exploration, some stealthy takedowns of robotic beasts guarding the place, and culminating in a final battle against one of the bigger robots of the world you’ve grown used to. Your reward in the end is the ability to override (or, hack) additional robot beasts, adding more potential friends and steeds to your arsenal with every Cauldron conquered. Horizon Zero Dawn is game that forces the player to rely on crafting: that means ensuring you actually have room for it all. Towards the start of the game, you should savor all your well-crafted supplies you’ve retrieved from plants, human enemies, and the robots you’ve overcome, and invest them where it’s direly needed most: your resources bag and arrow supply. Most of your space upgrades will require animal meat, in addition to the other easier to come by supplies, so be sure to camp out in a field and hunt as many foxes, boars, and raccoons that you see. Horizon Zero Dawn has three classes of weapons: Nora (green), Carja (blue), and Shadow (purple). Shadow is the strongest weapon class in the game, so building up the supplies and tools to trade with a merchant in a nearby settlement will give you a leg up in the ensuing battles. Also, as you progress, you’ll likely accrue dozens of modifications and outfit weaves. Using the same color guide as above (green is uncommon, blue is rare, and purple is very rare), embed outfit weaves into your armor and modifications into your weapons. Careful though, unless you have the Tinker ability unlocked, there’ll be no way to retrieve it: only replace it and lose the modification that rested in its place.